as if the universe is not toying with me enough, my only home computer crashed last night. Am posting now from the iPhone. Have cat scan and MRI thursday morning at 8:30. Out of work until then. T.V.s also on the fritz and iPhone connection is iffy. Thank heavens for good meds that keep me sleeping. Have no idea if, when, or how the laptopp will be fixed. My posts may be few and far between for a bit, but will post medical updates as they happen. Didn’t even make it through half a shift yesterday. Fortunately, another server was trying to pick up a shift, so I let him have mine – and then I called my mom from the break room, crying. She advised me to go ahead and get today’s shift covered – she had a feeling I’d drive all the way down there, have the same issues, and have to drive all the way home – a major waste of gas, plus an inconvenience to my managers if they’d have to cover my shift with no notice. I took her advice and had them cover today, but that just leaves me sitting here feeling guilty for not providing for my family. If stress has anything to do with my current health situation, then this is NOT helping my case in the least. I’m supposed to get test results today – and I plan on calling them every hour on the hour beginning at 9 a.m., which is about 20 minutes from now. If this is what I’m dealing with, the Rocky Mountain Spotted Fever, I mean, then I want to grab the bull by the horns and begin treatment aggressively and immediately — and if that’s not what I’m dealing with, then I want to figure out what the F is going on in my system so I can get it fixed! The meds they have me on help to a degree – it doesn’t remove the headache all together, it just numbs it up a bit – and the muscle relaxers knock me clean out (so I can’t take those at work) – but even sitting here in my desk chair I feel like there’s a water baloon stuffed under my rib cage – I can physically feel it. I feel it when I lay down…. I just want to know what this is and be done with it so I can return to my life. I hate writing the whining poor me posts, but it’s all I can do at the moment. I don’t have the energy to get into a Daily Dose, or to work on research for articles – although it’d be wonderful if I could be productive in some way while I’m not working at the restaurant. This would be the perfect time for me to get some of my website content ready… if I could focus on anything! I am blessed in that I’m surrounded by people who care, who would go out of their way to make sure we have what we need or to offer a bit of comfort. The dogs can sense that something’s wrong, and all four of them have been clinging to me for the past three days, especially Sirius. They had been trained to stay off of my bed, but Sirius now jumps up there any time he thinks I’m headed that way – and if I do lay down, he tucks himself in to my abdomen, while Bella-Beltane tucks herself against my back. They sandwich me. And if one of them moves to go get a drink or a snack, the other two dogs fill in, Odin taking the abdomen, Honey taking the back. I appreciate their healing energy and the constant love they surround me with. though it has no substance. By this I understand the value of non-action. Few among us are capable of this. All life is filled with the emptiness and the gentleness of Tao. With great care all things are sustained, nourished, and preserved, but Tao has no substance. It surges, it wells up, it pours through, it expresses itself in life, but it has no substance. Allow yourself to be hollow and let Tao course through your veins. Let it burst in your heart. Let Tao overflow into every askpect of your being. Allow Tao to flow. Cooperate with it. Enjoy it. Tao is free. It moves at liberty through all. But we have learned to obstruct the flow of Tao. We think that whe know when we do not. We think we can control when we cannot. We get in the way of Tao. Stand back. Let Tao move. Let Tao have a place in your heart. Let it move through your actions. Let Tao speak through your words. To be empty is the gift of the few. To experience this emptiness is the benediction of being human. It is the greatest joy, the most fulfilled state. Move toward this emptiness by allowing small moments of it to sweep through you. Make as much space in your life as you can for the experience of Tao. Sevens are about solitary introspection, seeking higher purpose, and learning to spend time alone doing what needs done. Wands, representing the element of fire, are about the “spark”, the initiative to set a thing in motion. Transformation. In this card, we see one man holding a wand, but he holds it as if it’s a weapon, or as if he’s using it to defend himself. This man either is, or feels like he is under attack. He must hold his ground. Because sevens represent a solitary state, the card could indicate the resolve to stand alone against opposing forces, to hold your ground even when outer influences are trying to sway you one way or the other. Description: The Seven of Wands is about taking a stand. Taking a stand is a forceful act that changes the energy flow of the world for good or ill. Most of the time we flow with our lives as if on a river. Events and feelings carry us forward with little effort. Sometimes, though, we are not content to drift. We want to resist the flow or change its course entirely! 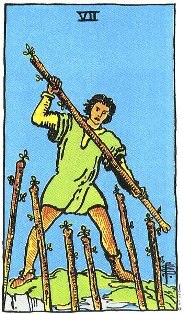 The figure on the Seven of Wands appears to be in a battle. He’s either attacking or under attack, probably both. When we decide to take a stand, we set in motion an energy of resistance. When we take up a firm position, others do the same. The Seven of Wands stands for aggression and defiance because they are two sides of the same coin. You attack; your opponent defends. He counterattacks; you defend. Some battles are worth fighting, others just cause trouble. If you are involved in a conflict, ask yourself if it’s worth the struggle. Is it important? Does it have value? Will the outcome serve you or others? If so, be bold and aggressive. Defend your position. Refuse to yield! If not, then consider letting the conflict go. Be honest with with yourself about this. You will be tempted to hold onto your position, especially if you have invested much time and energy into it. Don’t let battle lines be drawn unless the war is worth fighting. The Seven of Wands can also indicate strong convictions. In order to take a firm stand, you must believe in your position and yourself. You’ll need integrity and strength of character to see you through. If your cause is just, use the energy of the Seven of Wands to make a difference. As the fives indicated a particular problem, so do the sevens. The fives were about loss, losing momentum, losing love, losing an argument, losing money. The question there was, “How do I deal with this loss?” The sevens are about finding yourself in a situation where you are not in control. Sevens relate to the Chariot, a card about finding and maintaining complete control and mastery over wild or opposing forces. A man defends himself with one wand against 6 others. This is the “under siege” card. The stakes are high, and suddenly, the Querent is under attack; often when they’re tired or vulnerable. This is when others look at what you’ve done and get jealous or greedy. The Querent is being criticized, maybe someone is trying to take over his project. He’s on the defensive. How can he take back control? The card urges the Querent to stand his ground. Don’t give up, don’t surrender. If you do, your enemies will take control and show you no mercy. Fear not, success is near to hand. Tarot Symbolism: Six wands are already planted, which means that six senses (the sixth being intuition) are developed; and the seventh, the ability to leave the body at will, is being planted, or developed. 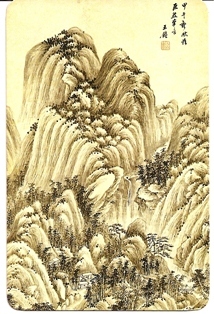 The figure represents a person who is willing to work hard without thought of self, for he is dressed simplyu and works on a barren hilltop. He cares little for the luxuries of the world; he is interested only in higher development. Self-sacrifice and determination to give service to others are his goals. Sometimes this is a martyr’s card. Astrological Influence: Third decan Leo. There is the power of the world beater in this area of the zodiac, but the problem is best expressed in the old proverb, “He who would conquer the world must first conquer himself.” The fiery power of this decan (the total power of the fire trinity) may have enough impetus to propel you to extremes. You need to develop steady but progressive attitudes in making your way in the world. You have a strong pioneer spirit and innate leadership qualities. You are tireless and can inspire others to work with you for worthwhile goals. As a Temporary Vibration: Haste, messages, settlements. Pursuits are approaching completion, and your rewards are in direct ratio to the efforts expended. Stagnant conditions are stirred up, and final settlements are made. This is an active, hopeful period in which you rapidly advance toward your goals. 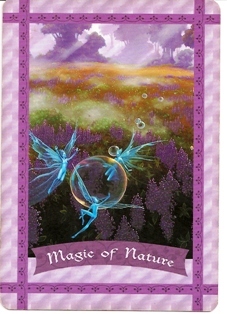 You may receive communications of all kinds and these messages propel you onward. Your messages are dashed off in return. Romance is emphasized now, and messages of love fill the air. A negative reaction brings about disputes, legal difficulties and delays. Business and love relationships can stagnate. Quarrels and domestic problems arise, sometimes because of jealousy or rash behavior. It requires extra effort on your part to bring about a settlement. Travel, perhaps by air, is very likely in order to bring affairs to a successful conclusion. This period sets the wheels in motion. Your affairs are obviously progressing, and you can see that time brings all things to their designated completion.